Stock market investing and financial decision making is linked to behavioral science. This field of study helps supplement scientific evaluation of market events by providing alternate explanations for them. Human behavior underlies financial decision making and may even influence the design of quantitative models, algorithm based trading, fundamental analysis and valuation equations. In other words, it is another important sphere of finance that is relevant to stock market events. Since human behavior cannot currently be scientifically predicted on a continual basis as evident in the inability of game theory and political analysis to do so, the 'next best thing' may be behavioral finance in the sense it can supplement scientific evaluation. Market psychology is an aspect of behavioral finance. 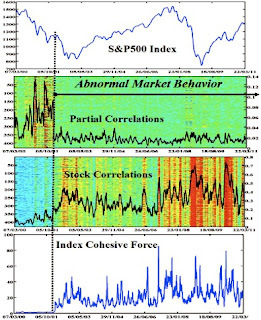 Market psychology refers to specific behavioral decisions that are reflected by stock markets in a way that defies purely numerical financial logic. Market psychology is generally associated with aggregated emotions such as fear, happiness, frustration and so on. Since humans are inevitably both logical, and emotional beings among other things, it is for the most part impossible to be quantitatively logical 100 percent of the time, which is when emotions and other psychological decision making processes can take hold of the stock market. Individual psychology is the component element of market psychology. A number of non-mathematical decision making techniques that 'behavioral finance' calls heuristics can affect investors' financial decisions. An example of a heuristic decision is one based on pattern recognition. Heuristics are an attribute of Prospect theory which according to Thayer Watkins of San Joss State University, states people are more likely to choose less money if the probability of acquiring it is 100 percent, but will take a greater risk for more money if the higher probability is lower than 100 percent in some cases. On the buying side of the equation is consumer behavior. This relates to the psychology of consumerism which itself indirectly impacts the stock market through consumer expenditures, an economic statistic often consulted prior to stock trading. According to the University of Southern California at Marshall, consumer behavior deals with matters such as what social influences, thought processes and perceptions affect buyer behavior. Moreover consumer behavior studies how these influences can themselves be affected by advertising and market research. This TED video about cognitive traps common to being in love and investing made me think of some of the behavioral finance content you've put out there. Keep the good stuff coming on the psych of investing!